Joan Miro enjoyed no closer relationship than that between his mind and his canvas. The painter was placid and reticent even to those who knew him well; he could sit with friends for hours without saying a word. Miro kept his studio as tidy as a doll's house, scrubbing himself head to toe after carefully cleaning his brushes and lining up his tubes of paint when he completed a long day of work. He then donned his neat clothes, which echoed his background as a Catalan peasant but still a member of an elite Parisian arts scene. Yet behind the clean-cut exterior was an insatiable attraction to artistic chaos—Miro said he wanted to "assassinate painting." Until June 15, the New York Museum of Modern Art's exhibit "Miro: Birth of the World" will reveal the artist's myriad styles and ideas that blossomed on canvas, and his laborious path to illustrate complete freedom. Miro (1893-1983) was born in Barcelona and moved between the Catalonia countryside and Paris for much of his life. His pride in his Catalan heritage was a feature of his art throughout. Catalans valued freedom above all else, which was symbolized in the red wool caps peasants wore and which often can be seen in Miro's paintings. His father was a goldsmith, his grandfather was a blacksmith, and his preferred simple rural life kept him both grounded and dreamy. "We Catalans believe you must always plant your feet firmly on the ground if you want to be able to jump into the air," he said. "The fact that I come down to earth from time to time makes it possible for me to jump all the higher." Visitors young and old who gather at the MOMA may see the meaning of radical freedom in Miro's work, distinguished by sinuous, delicate marks that radiate spontaneity and impulsivity. Perhaps the best example in the exhibit is The Hunter (Catalan Landscape) (1923-24). The landscape is not meant to be a reflection of "outer reality," Miro said. The painting, which began as a scene of a peasant making lunch, turned into a dazzling, chimerical scene of detailed, geometric shapes atop beds of soft rose and oily green. The effect is dizzying and odd, marked by an eye bordered by fleshy pink that stares at you from the canvas. It "is the eye of the picture staring at me," Miro said. Miro experimented with his era's fashionable movements—Fauvism and Cubism—but some of his most captivating works are "detaillist" paintings. He homed in on meticulously shaded, diminutive shapes and squiggly lines to render plants or stones. He called this determination to concentrate on the smallest parts of the picture part of his "slow understanding." "Joy at learning to understand a tiny blade of grass in a landscape. Why belittle it?" he said. "A blade of grass is as enchanting as a tree or a mountain." The small details in his still life paintings beckon visitors to gaze at otherwise simple images. When Pablo Picasso looked at Still Life II (1922), he declared, "This is poetry." An orange trapezium exudes a shaft of sunlight surrounded by gray-green shadow. A meticulously rendered slice of tomato rests in the lower left corner, next to a shining oil can. In Glove and Newspaper (1921), Miro turned the canvas so the width was shorter than the length to make the still life a portrait. The simple twist makes the painting more arresting. Many museum-goers claim that most still life paintings are boring—Miro's grasp of composition and placement kicked that idea to dust. Because Miro's whimsical paintings easily mystify the viewer, it is no surprise that he approached his work as a spiritual performance. He constantly read poetry and the works of St. John of the Cross and St. Teresa Avila, and his paintings achieve his goal to echo poetic rhythm. "Before taking up paper and pencil I carefully washed my hands," he said, "and then worked as if performing a religious act." He understood painting and aesthetics as aspects of creation that surpassed human reason, and this way of thinking is most visible in his Surrealist works. In 1924, Miro joined the Surrealist movement. The movement's founder, Andre Breton, considered Miro's involvement integral, and even argued that Picasso likely joined the group because of him. 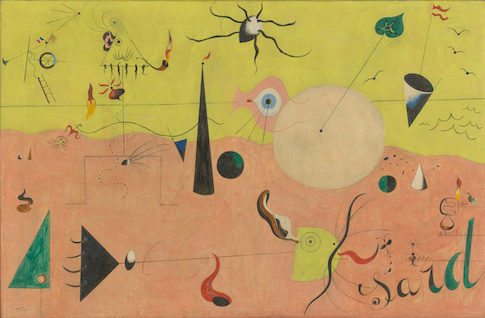 The MOMA has hung some of Miro's most famous Surrealist pieces on its walls. A few are marked by nonsensical Dadaism, but they repay patient viewing. 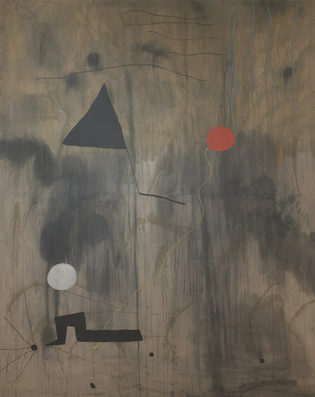 The Birth of the World (1925), a Mural Painting (1950-1) that he made on a commission for Harvard University, and the Portrait of Mrs. Mills in 1750 (1929) all show Miro's unique grasp of the two movements. The Portrait of Mrs. Mills engages the eye with strange shapes and bright, flat colors, which are given dimension by negative space in the painting. Meanwhile, The Birth of the World is simple, with a grayish-brown background that provides space for a red circle, black shapes, and delicate lines that shoot out like debris forced from an explosion. make sense, but Miro's painting was Miro's mind. As the Spanish Civil War advanced, Miro was visiting Paris and decided to stay. There, in 1937, he created Still Life With Old Shoe. The painting is both dark and bright, with psychedelic patterns you would find on a 1980s' windbreaker. The colors are so fierce it takes time before the eyes can focus on the forms they reveal: a shoe, a fork, a bottle. 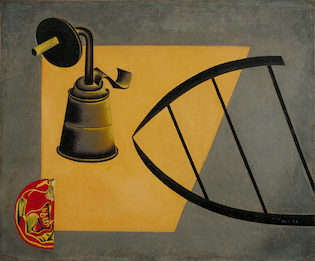 This still life is a far departure from his stylized early works. In Paris, although inspired, Miro felt uprooted from his favorite surrounding: the countryside. His anxiety caused him to explore "something absolutely different," to find through painting "the deep and poetic reality of things." The MOMA's exhibit challenges the imagination. Visitors will leave inspired by new shapes, perspectives, and individuality. It is difficult to find inspiration from other artists in many of Miro's works. He would take the latest movements and twist them into something completely new. In a biography by his friend Jacques Dupin, Miro is described as slow-moving and deliberate, with a ferocious compulsion to paint. And this compulsion was driven by his own need for complete freedom. Miro strove to find it in his mind and in nature, documented on canvas. "May God grant that I never lack for Holy Anxiety," he once said. "It is thanks to her that men progress." This entry was posted in Culture and tagged Art Reviews. Bookmark the permalink.